This guide turned out a bit more lengthy than we expected - who would have thought that the subject of social media planning for podcasts is so complex? That means that we’ll be covering anything and everything related to social media planning for podcasts, so if you don’t have the time, or you’re interested in a particular topic, you can use the table of contents on the left to get you there. Now let’s dig in! Plenty of other tips and tricks. How to promote your podcast in 2018? Podcasters are a fairly new caste of the digital realm. They are the creators of digital series made available on the Internet for downloading and listening on any device, conveniently packed in audio, and received by subscribers automatically. We can think of them as the love child of radio shows and the internet. If you’re an aspiring podcaster, chances are you’re also an avid podcast listener, and in that case I’m sure you know. However, enjoying podcasts on a daily basis is one thing however, and making a successful podcast quite another. Fortunately for you, it seems that the time for popularising a podcast is just right – as they are getting more and more popular, commanding emerging audiences and breaking listening records. Podcast listeners are much more active on every social media channel than the entire population – 94% of them are on at least one social media channel, as opposed to the percentage of the general population – 81%. That means that social media is the best place to look for your perfect podcast audience, apart from podcast services like iTunes. So many changes have happened in the past 5 years in the world of podcasting and social media marketing, but one thing is certain: You definitely need social media to reach your podcasting audience, because the facts say that they are all there. Podcasting now just needs a strong strategy and online presence to keep its flow of listeners steady and entice listeners to keep coming back. No wonder the popularity of podcasts has been steadily rising over the years – they can cover anything for crying out loud – from drama to comedy, from wellness and mindfulness to rock’n’roll, from literature to juicy celebrity tidbits and much more, and that’s only the beginning. The best thing is – there’s an audience for all of that. So, do you want your podcast to pick it up with your target audience and develop a fan base? Do you want to double your listenership? Regardless of whether you’re a seasoned veteran or a podcaster on the rise, we’re here to lend you a hand – this guide will give you all the tools you need to make it successful through social media. When it comes to podcast promotion, relying solely on iTunes doesn’t seem to do the trick anymore. Many young and naive podcasters rely on Apple’s ‘New & Noteworthy’ algorithms alone to build their podcast product and think that once they are noticed their podcast will shoot to the stars. But that’s hardly the case. Product and marketing are both necessary for any business to survive, and it could be argued that they are equally important. The fact that more and more new podcasts are being launched every day, it is becoming increasingly important to have an actual strategy behind your podcast marketing. hat doesn’t mean that iTunes isn’t key – it is, don’t get me wrong. Listeners go there with the intent to find an awesome podcast, which means they are more likely to click on yours than they would be on social media. But! Savvy podcasters know that they have to use Social Media every day to grow their audience in the long term. You won’t always be “New & Noteworthy” after all. And what happens with those potential listeners who don’t go to the trouble of visiting iTunes on a regular basis? We’ll be showing you how to find them, reach them, and convert them on social media. Think long and deep what kind of people you want to attract to your podcast, because that’s probably the most important thing in every marketing strategy. It’s what will help you focus your efforts where they count the most – as opposed to spreading them thin without a purpose behind it. The most important parameter for determining what social media platforms to include in your podcasting social media strategy is – audience. When it comes to marketing, there’s no bad social media network, but you have to focus your attention, and meet your audience exactly where it wants to hang out. Once you nail your target audience, you’ll only have to worry about giving them what they want to hear. Deciding who you want to reach is the first important step to reaching anyone in the first place. Once you have a target audience nailed, you can take a look at the leading accounts your newfound target audience is following. You can use them to see what types of content work well, and let it inspire your content. Hint: As a podcaster, mobile users are your most valuable target audience. Apart from that, I encourage you to forego any notion of targeting an audience by demographic alone. Delve deeper into your audience’s interests, likes and dislikes, geographic location insome cases, and most important than all, user behavior. You want a narrow target market, with an identified listener persona. When it comes to the question of where to find your audience on social media, the first answer that comes to mind is naturally Facebook. That might not always be the case, as emerging generations tend to like platforms like Instagram and Snapchat better, but all things considered, it’s unwise to avoid Facebook in your social media planning. We’ll look at some great ways to use this giant of a platform for your podcaster marketing. The platform has a selection of mobile-oriented ad types. An unexpected social media development of the past year has given us Facebook live audio. Now, even if you aren’t excited about doing a live show, and before you argue that your show is always pre-recorded, and, most importantly, takes editing, i encourage you to think it through. When Facebook introduces a new feature, it gets priority in organic reach as an incentive for people to use it more. Does it have downsides? Yes. You record through your smartphone, so at times, the audio might not be best. It’s difficult to have a guest call in the show. But is it a valuable weapon in your podcasting arsenal? Absolutely. Sign up to Amplifr and connect your Facebook profiles and Podcast Pages and Groups to manage them effectively and hassle-free. 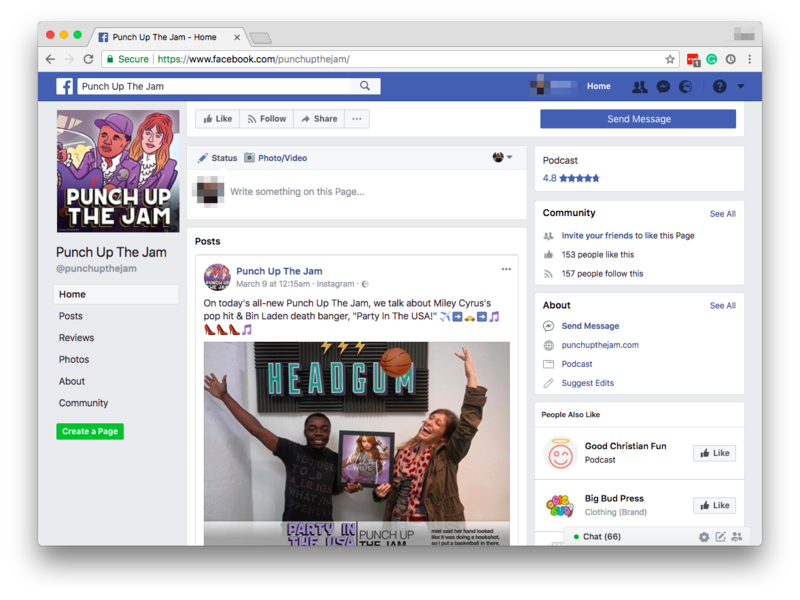 Why not use Facebook groups to turn your past, present or future listeners into a tight online community? You can throw in some content marketing that focuses on the content of your podcasts in written form, and let your audience dig in. Provide advice, support and handy resources – your fans (and also none-podcast audiences in your niche) will thank you for it! When it comes to Facebook advertising and marketing in general, just remember your ultimate goal: to get people to listen to your podcast. Ads are great for ego, but although it might be easy to get page likes, that doesn’t necessarily mean you’ll get people to actually listen. We’ll be covering effective social media advertising in the following sections, but you can also check out our guide for Facebook social media marketing for even more tips on Facebook advertising. This may seem like an odd platform to include in your list of social media profiles you use for podcast marketing. However, if you do have a dedicated fan base, here’s where you can give them a more intimate experience of their favorite (or soon to be favorite) podcaster. Snapchat can be used in a more personal manner than any other social media channel. The content you post there can be mundane, fun, and creative. There’s no need for an edited-to-perfection aesthetic on Snapchat – you can share personal life experiences, juicy details from your life or next podcast ideas, all in a lighthearted manner. You can give your audience the behind-the-scenes feel that dedicated fans always love to get their hands on. It’s an entirely different tactic than simply engaging with your audience on other social media, but it can be just as effective. You’ll be embracing a new medium before it gets too crowded. Hint: leverage your already established social profiles or email list to find potential followers and use your personal Snapcode. 80% of the time spent on social media happens on mobile, and Instagram is without a doubt one of the front-runners when it comes to mobile use. We’ve already established that mobile users are your definite target, since a lot of listeners actually enjoy their favorite podcasts on the go. 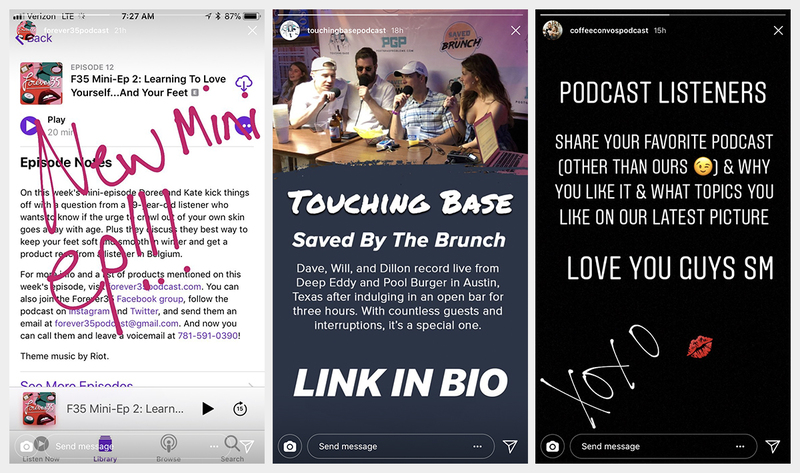 And while Instagram doesn’t seem like an intuitive choice for promoting audio content (it’s not like your podcast can snap pictures of its lunch, or take bathroom selfies), many podcasters are having success getting attention through Instagram and engaging with both current and potential listeners. Most of the top podcasters are on the platform. So, how to use Instagram for podcasts? Use the stories feature for a short trailer or an image promo. If you have more than 10,000 followers, you can insert a link that will direct your followers directly to your new episode when they swipe up. For more info, check out our tips for driving traffic with Instagram stories. This is a handy tactic on any network that isn’t that big on text. Plus, it’s the first thing your fans and followers notice when they visit your profile. Your bio section is there to tell your potential and current listeners what’s your story as a podcast creator. So why not give them an idea of what they should expect from your show? Try to use lots of niche-related keywords to connect with your fan base while you’re at it. If you have a basic account, Instagram only lets you include ONE link, and it lives in your account’s bio, so make it count. Although your first thought may be to link directly to download your podcast episodes, we recommend linking to your podcast website instead if you have one. One golden rule for getting word about your podcast out there is to find the hashtags your audience is using, and use them yourself. On Instagram, posts with at least one hashtag get 12.6% more engagement than those without. Which shows exactly how important they are for content discovery. This can certainly work on any social media network, but we know that when it comes to hashtags, not all social media platforms are created equal. 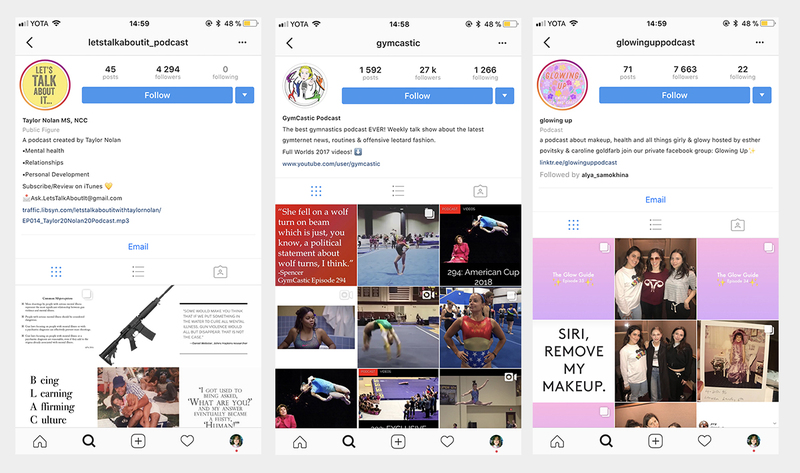 Instagram is particularly friendly when it comes to hashtag use – people can now follow topics generated by hashtags, and if you’re smart with it, they will see your updates when they are searching for a particular topic of interest. Sign up to Amplifr and connect your Instagram profiles to receive best posting time predictions and compare Instagram metrics with other sources. General hashtags are awesome, there’s no word about it, but you can go the extra step of creating your podcast’s personal hashtag. Sure, at the beginning, nobody will be talking about it, but once your podcast starts getting attention, that can all change overnight. Give your listeners a tool they can use to express how passionate they are about your episodes. Hint: Instagram lets you create a branded hashtag, unique to your business or marketing campaign. It can be the name of your company, podcast, exclusive to a particular event, or a related tagline. Instagram is not an audio friendly platform, that much is clear. So if you want to promote your podcast on it, you’ll have to resort to other media, such as images and videos. We’ll go into detail about how to use different content types to promote your episodes on social media in the following sections. Want some expert advice on Instagram marketing? Be sure to check out our Instagram SSM monster guide. If you want your audience to share your podcast in a way that’s easier for other people to listen to, then SoundCloud is definitely an awesome place to re-publish your episodes. Especially on Twitter. Twitter lets its users play SoundCLoud audio directly from their Twitter stream, through clicking on a SoundCloud link. Whatever you do, be sure to schedule follow-up tweets later, because your tweets can get pushed down pretty quickly in the tweeting avalanche. Hashtags are pretty big on Twitter as well. And there’s nothing like good hashtag use that can get you engaged with your target audience and participating in conversations highly relevant to your podcast. So when it comes to hashtags, the rules are simple: find them, use them. Don’t stuff them. Sign up to Amplifr and connect your Twitter profiles to check which hashtags are the best for your promotion. There’s one thing you want to avoid however: sounding obviously promotional. As in all your online marketing, your tweets simply must benefit your potential audience, not you. Do not cram your Twitter feed with an endless stream of sales pitches. Instead, try adding real value to the conversation – it will encourage users to check out your profile, get exposed to your podcast link, and maybe become listeners. There’s a fine line to talk when it comes to sharing content on any social media channel, but Twitter is especially important, since it’s arguably the most fast-paced social network out there. Some people make it a habit to go overboard with hashtags there, and cough out tweets like crazy – tweets featuring a direct link to their podcast audio. Is there any benefit to adding a dozen loosely related hashtags? Although Twitter doesn’t count them towards your character count anymore, you don’t want to overdo it. Hashtagging really helps, when the hashtags are relevant. Tricking your followers into clicking a link that will lead them directly to your audio (as opposed to your website can irritate them), especially if you manage to kill their mobile data plan. Even if you get more clicks, it can have an opposite effect on retention rate. Do you want to alienate your dedicated fans? Remember, what counts on Twitter is engagement. Engage the community with retweets, mentions (@Replies), and personal tweets. Remember, only 25% of your posts should be promotional (read Automated). Tag guests in tweets when you have them in a podcast episode, and always acknowledge them and your fans when they’re talking about your podcast. We’ve focused on a few podcast related tactics for marketing on Twitter, but if you want more, we have an awesome Twitter marketing guide. You have a couple of options for making your podcast YouTube friendly. The first one is to convert audio (.mp3 for instance) to video (.mov), and there are plenty of tools out there that can make that happen. If you set your mind to it, it can be no harder than grabbing some free stock images, including a thumbnail logo and that’s it! You could simply create a movie from your audio with your podcast logo for visuals and upload that to YouTube. Then, you can include a link to your actual podcast in your episodes’ description. Hint: Link the episodes together in a playlist so they can be watched in an order, and give them a good SEO title. If you want to get a little fancier, you could record your episodes as you’re doing them. You could even edit the video to jump back and forth depending on who’s speaking. I’m not saying you should do this with absolutely every podcast episode if you don’t want to. After all, that can up production costs as well as take a bit more of your editing time. That being said, chances are you already have everything set to record an audio, and adding a camera won’t create too much of a hussle. It’s a worthy idea to consider, especially when you’re recording a long-awaited episode, or discussing a particularly hot topic. Hint: Always include whatever you can in your episodes’ description: links to your website, notes, transcripts, links to your other social media profiles and calls to action. This goes for any YouTube video, podcast or not. LinkedIn is likely not the first network that comes to mind when you ask yourself how to promote your podcast on social media. But, the network is swarming with professionals in every niche imaginable, and likely some in yours. It can be a great way to get in touch with potential podcast guests (including influencers) and spread your influence online. 44% of department heads are listening: VPs, owners, and C-suites. LinkedIn lets you insert media links in your profile: The summary and project sections are ideal for featuring a podcast. If you haven’t caught up, LinkedIn’s publishing platform allows you to not only publish native posts, but also embed all kinds of media, from podcasts to tweets. Promoting your podcast on Google+? That’s right, we still haven’t exhausted all our social media options. Let’s look at the pros of using Google+ for marketing your podcast on the platform. Everyone you email can see your Google+ profile. Okay, these are not exactly social media networks, but they are absolutely crucial for getting your podcast out there. iTunes is undoubtedly the podcast directory to be in. Statistics show us that “70 percent of podcast listening actually takes place through iTunes or the native iOS Podcasts app.” After all, people go to iTunes with the sole intent of finding a new podcast to listen to. 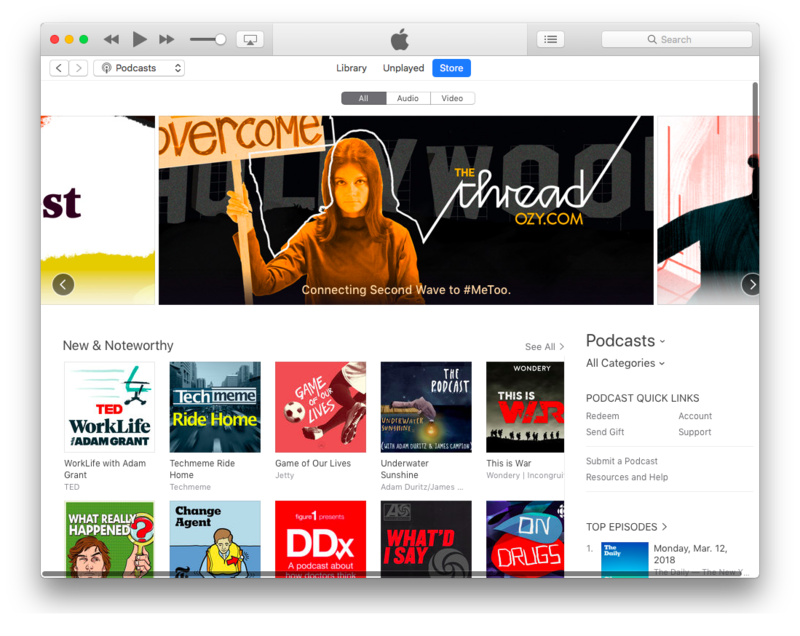 iTunes is the largest podcast directory on the planet. It has an audience capacity of over 60 million people who search out for digital content almost daily. Therefore, listing your podcast on this site will increase the chances of someone actually getting hooked on your show. If you haven’t thought about podcatchers, you’ll be surprised to find out that there’s a whole new uncharted territory waiting for you to discover. Podcatchers is a term that refers to apps and services that list podcasts. They’re directories, but they also make your podcast available to play. 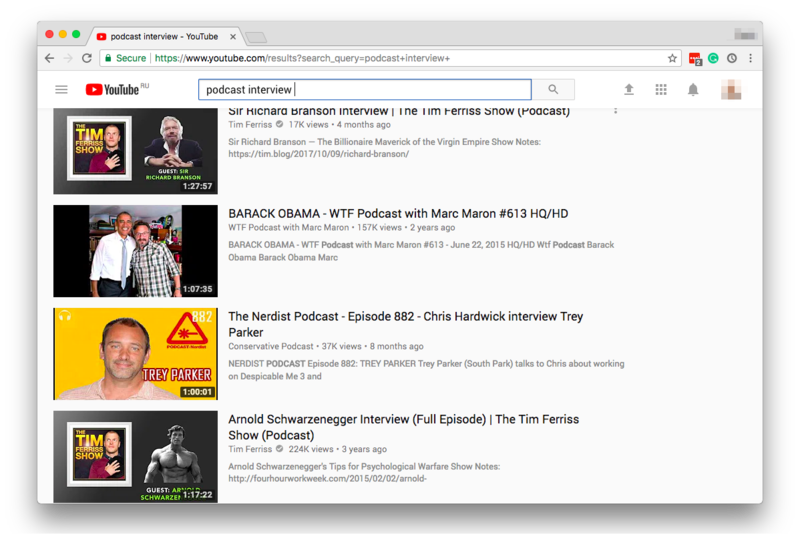 And they are quite handy – your potential listeners will rarely, if ever, navigate to your site to listen to your podcast, they’ll use podcatchers instead. While iTunes should be considered THE place for podcasts, having yours listed with the popular podcatchers is a smart move. Take Android into consideration. There is no iTunes for Android, so you’ll have to find the right apps for Android podcast listeners to be able to find your show and listen it on the go. As a podcast creator, you want to make sure that all the hard work you’ve put into creating your show gets recognized, and receives the attention it deserves. We know that when it comes to marketing, the world of podcasts might seem like a planet of its own, but the key is that you don’t rely entirely on search engines. You should spread the word through social media – and we’ll show you the most effective tactics you can use. Possibly the most important step you need to take when you’re starting your new show is to sit down and devise a proper launch strategy. Or should I say multi-launch? The last thing you want to do is create an awesome pilot episode and then leave any audience you might come by hanging for more. Every seasoned podcasters knows how important it is to give your audience more in the beginning. It’s either they’ve done it and scored, or wish they did. Launch 3 or more episodes on launch day (up to five is pretty good). The minimum is three, but the more the merrier! Set out a timeframe for your next installments. Have at least two episodes in editing, or ready to go live for the next two weeks. Include an in-episode teaser for the next installment, with details on airing time and topic. Always make your podcast’s launch date and regular airing time as transparent as possible. Don’t ever forget to include details about your next release when you are wrapping up your current episode. And that’s not a pin as in Pinterest. Think Facebook or Twitter. Pin an especially popular episode that is bound to get any new guest on your social media profile immediately hooked. Don’t forget to stick your iTunes or website URL (or whichever podcast service you’ve made your work available on)! Tease your audience to death. This is an oldie but goldie, and for a reason: teasing your audience has proven its worth in marketing. Okay, maybe not to death. Talk about the behind-the-scenes on Instagram or Snapchat story. Forget to include a podcast URL. Not everyone knows about your podcast, so re-promoting old, “evergreen” content can work wonderfully for getting the word out there. 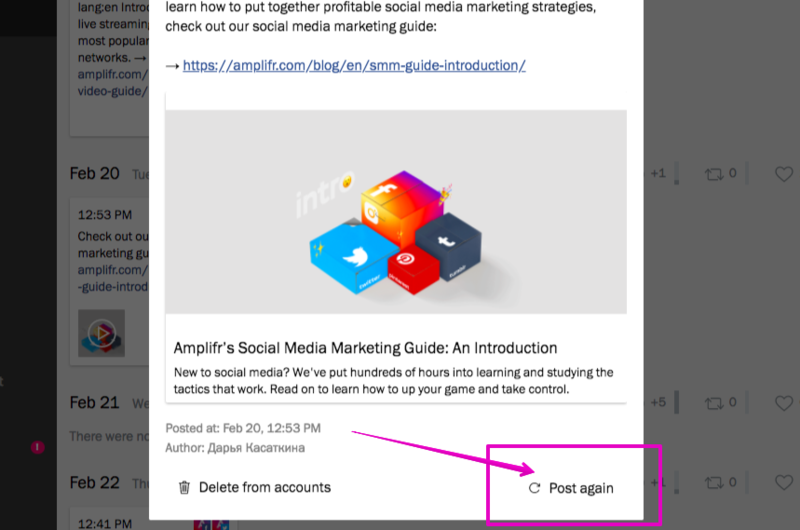 Reposting on social media is a truly subtle art: on one hand there are benefits to be reaped from repurposing content the right way, but on the other, there’s carefully walking the line and stopping right before you appear too spammy. However, when it comes to podcast episodes, it’s better to overshare slightly than not share at all. The facts are simple – it’s a content jungle out there, and your episode update can be easily lost among the avalanche of posts. In case you’re wondering what would a good reshare ratio look like, it always depends on the network. With Twitter you can go as high as 10 tweets a day (of course, not all of them reshare), but on Facebook, once or twice a day or less should do the trick. What’s more important that number-of-posts etiquette is post quality, and that always wins out. Don’t post for posting’ sake, post because you have something to say. Remember that earlier podcast episodes are evergreen content. Forget to keep a fine balance between new and repurposed content. As much as it does for podcast promotion, announcing your podcast episodes on social media is one thing, and driving engagement is completely another. Master podcasters understand how crucial it is to make yourself available for your fans on social media. There’s nothing that can spark the interest of your most dedicated audience better. There are a number of podcasters who answer a staggering amount of questions they receive on social media – and that’s the best kind of promotion. If you’re a passionate podcast listener yourself, which podcasters you are more likely to follow? The one who’s Twitter-bombing your feed constantly, or the one who takes the time to listen what you have to say and give feedback to their community? Hint: Use social media to interact with your audience in a meaningful and authentic way. And make sure you go beyond a repetitive “thanks for sharing” or “glad you like it”. Start conversations, your audience will love you for it. If you want your current listeners to keep coming back for more, being consistent with your episodes is really, really important. If your show runs for half an hour, try to always keep it that way. If you post every Wednesday, do it religiously, and try not to miss an episode. You want listeners to make a routine out of listening your show – and missing an episode can definitely break those habits, and cause you to lose listeners. But consistency doesn’t only apply to your actual podcast. It’s crucial to implement it in your social media marketing as well. Hint: Here’s a guide that will teach you all you need to know about social media analytics and reporting. Do: Using hashtags is one of the best ways to get discovered on social media, and reach new audiences. Always find the appropriate hashtags to use when you’re covering specific topics, talking about certain brands, or discussing particular events. As we know, there are hashtag friendly social platforms, such as Instagram and Twitter, and not so friendly ones, such as Facebook, but the rule generally applies to them all. The difference is that on platforms such as Facebook, you need to take a more personalized approach, and go with one recognizable and meaningful hashtag, as opposed to hashtag stuffing. Don’t: Hashtag stuffing is a definite no-no. Don’t cram in as much as possible, especially not endless variations of the same thing. Weight loss and losing weight are essentially the same thing for example, and algorithms understand grammar and synonyms for the most part. Stuffing hashtags will make you appear more spammy than you’d like. An always important aspect of every social media strategy, regardless of the type of product you’re trying to get out there is influencer marketing. And this is an especially effective strategy if your podcast has an interview format. Your guests can sometimes have a very substantial audience, and why not convert a one-time visit into a recurring affair? The basic goals and rules of influencer marketing are essentially the same as for traditional content marketing. Existing influencers have huge audiences, and if you can get their attention, you’ll earn at least a portion of that audience for yourself. Get an influencer’s attention by mentioning them on social media, highlighting a topic they’re interested in, or talking about something they did or said on your own podcast, then inviting them to contribute on a future episode. From there, work to build an ongoing and mutually beneficial relationship. This is an effective tactic that uses both hashtags and tags to leverage your guest’s audience. When you’re doing an interview, always make sure to tag your guest and hashtag the topic you’ll be covering in your social media updates. Don’t forget to create a visually appealing template, and include a quote from your guest. Hint: Use your usual social media profiles, but pay extra attention to the social networks your guest has the biggest audience on. Since we already established that your guests might have a pretty big audience themselves, ready for you to tap into, why not go the extra step and make it as easy as possible for them to promote your podcast? If you can get your guests to promote your episode in which they appeared on social media, or equivally important, to their email list, the result could be a huge influx of brand new listeners to your podcast. You’ll be making it extremely convenient for them if you make sure to include a list of shareable media. Send them an email when your episode launches, with a link to your show notes and the episode on iTunes, and also make sure to give them a few scripts they could use to let their audience know about it. Pre-written tweets and status updates. Always try to make it as easy as possible for your guests to share your episode, especially if they are high-profile ones. We’ll go into detail how to make all of the above social media content types awesome and shareable. Apart from simply having an official podcast profile on several platforms, it’s vital to use the power of personal branding and bring your host (s)’ personal profiles to the mix. It will spread your social media presence, flesh out your visibility and amplify your social media messages. Your hosts are going to become the face of the brand, so they need to be active on social media, interacting and engaging with users, and promoting the podcast. If it wasn’t painfully obvious already, let’s clear it up once and for all: being a guest on other people’s podcasts is a great way to promote yours. Even if that means appearing on your competitors podcast. You can spread the word about your own show, with amazing results – since you’re reaching people who are interested in your topic and who are already in the habit of listening to podcasts. And people tend to listen to multiple shows on similar topics. Reach out to a few of them weekly with a pitch explaining why you should go on their show. Of course your pitch won’t always work – sometimes you’ll hear crickets, but they important thing to do is to keep going and you’ll eventually score a hit. You don’t need to feel concerned that you’ll be giving your competitors a boost, and think of it as collaboration. Besides, you can always find podcasts operating in a slightly different niche that you can pitch your guest appearance to. You’d be surprised at the results. The more relationships you build with other podcasts, the more possible guest candidates to bring on your own show as well. Other podcasters will by default be interested – chances are they will recognize the possibilities to cross-promote their own show. It’s the best kind of team work. You might think this will make you appear desperate for ideas. I’d say the chances for that are pretty slim. 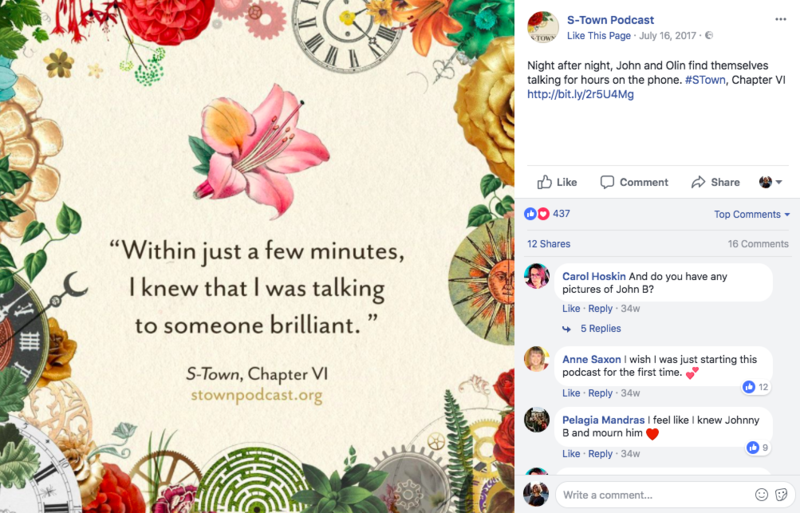 If you ask your listeners for direction on topic ideas you’ll be doing three things at once: getting inspired for new content, making listeners feel more involved, and engaging with your community in a genuine way. Hint: Tag users on social media when referring to their ideas. Getting mentioned by their favorite podcaster is one sure way to make them lifelong fans. There are thousands and thousands of other podcasts vying for their attention. No matter the genre, each episode of your podcast should have at least one, but preferably a few selling points. Before you post on social media, try to identify what are your episode’s selling points. Write them down, and then carefully weave them into the copy of your promotional social media posts. Did you bring an exclusive guest? Are you delivering on what you promised or hinted at in previous episodes? Have your topic been requested before? What’s the secret to increasing your listeners? It’s plain and simple: entice your podcast listeners to come back. Good listener retention, or in other words, a loyal audience, beats out a large audience in almost every capacity, especially if you want to make money from your podcast. If you are looking to make a few bucks, then you need a loyal audience. Fans of your show will want to support you. There’s no marketing strategy in the world that will make your listeners stick with your podcast if it isn’t something that they love. According to Podcast Insights, “podcast listeners are loyal, affluent and educated”. Why not use that to its full potential? The thing with marketing is: it doesn’t matter if you aren’t creating high-quality content. Make sure you do that, and after all, you only need to strike a vein with a particular type of audience, and they’ll be always coming back for more. Is this your first time recording and launching a podcast? We already mentioned how important it is to do a multi-launch. Take our advice and record an extra episode or two, and this is important because of two things. First, you can include a preview of what your next episodes will be about and the next topic you’re going to cover. Having a couple of episodes available after your launch can get you a spike in listener retention – they will have a chance to listen to you a bit more, and they’ll know better what to expect. If people continue listening to other episodes, you’ll get a much better idea whether your initial episode was a success, and whether people liked it enough to keep listening. While mobile consumers’ attention is undoubtedly decreasing, they still need to focus their attention in the small window of free time they choose to spend on social media. And giving them that is the most important goal for your podcast promos. Be visually appealing – the golden rule for any marketing material, right? Have a clearly stated CTA (“tune in”, “listen to”, etc), so that your audience knows what’s the next step if they are interested. Now, if you’re good at coming up with a title, i’m sure your episode title will speak volumes, but will it be able to hook readers on its own? You can err on the side of caution, and find a powerful quote or excerpt to go with it. Think about what are the most quotable moments from your episode. Pull the top three to five, and use them as promos. And as we know how effective visual content is when trying to catch your audience’s attention, drop them into an image. If you’ve been in the podcast family for a while, you should have developed a distinct visual aesthetic for your brand. It doesn’t matter that your main business is for the ears, maintaining a unique visual presence is always a major factor in successful branding. Here’s a guide that offers a few tips and tricks on how to develop your own personal visual branding. Your trailer can be featured and played on other podcasts. Okay, making a habit of transcribing your podcasts is not marketing per se, but it can make your content more transparent and approachable. It will give listeners an alternative medium to follow, it will make your podcast content easily quotable – it will even appeal to any hearing-impaired listener that you shouldn’t rule out yet. Not to mention the SEO perks – a transcript blog post can help you optimize your site for search engines, which in turn helps with site ranking and organic traffic. Just to keep everyone in the loop, podcasts are audio. Audio is not the absolute king when it comes to engagement on social media. Video is. That’s why you’ll have to tweak your material a bit, if you want to drive more engagement on social. 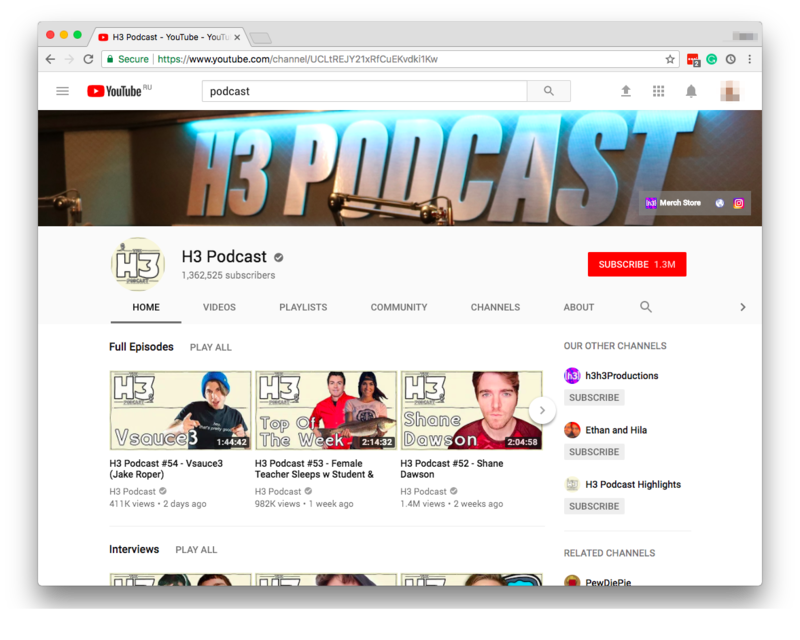 Earlier, we mentioned repurposing your podcast for YouTube, but you don’t always have to do full episodes – you can do short clips featuring the funniest, or more interesting podcast moments, bloopers, or whatever comes to mind. Consider doing videos for a behind-the-scenes promotional content, if not for your whole podcast episodes. As always, don’t forget to include a link of your actual podcast in your social media update! Social users love to be in the moment, and there’s no greater application of this than a live stream. We already mentioned Facebook live audio streaming, so be sure to put it to good use – you are going to get an interesting spike in engagement. Work just as hard to promote and distribute as you did to create your podcast. If making sure you give feedback on your SM channels is a sure way to drive engagement, making a podcast out of them will give you engagement on steroids. Answer questions quickly and helpfully. Hint: A reminder – Facebook Audio Live streaming is perfect for this. Occasional Q& A podcasting can make all the difference between you and other podcasters in your niche. People you choose to answer to not only have a higher chance of becoming lifelong fans – they are more likely to bring their friends for the ride. And we know that your fans are your brand’s best ambassadors. The beauty of all of the techniques discussed in this guide so far is that they are all free! But if you’ve exhausted all paid methods and want to branch out to paid advertising as a marketing strategy, that can’t hurt either. Podcast listeners are likely to be technology savvy – they are usually not that exposed to TV advertising, because they’d rather subscribe to Netflix, HBO, or Amazon Prime. That means that you’ll have to plan where to invest your advertising very carefully. After all, that’s true of any paid advertising on the internet. As we’ve said on numerous occasions – internet roamers are exceptionally ad resistant. So are there any good ad practices for podcasters? Sure there are. Now, I risk sounding repetitive, but, whatever you do, you need to focus on mobile. 82% of mobile podcast listening happens on iPhones, so target your audience where and when they’re most likely to take action: when they’re on their iPhone. You can set up an ad that targets only users who are accessing Facebook using an iOS device, and which opens the Podcasts app and takes the user right to your main podcast page within the app. Here, they can view your latest episodes and subscribe. Compare running these ads targeted to people who like your page as well as people who don’t, and see what gives you a better ROI. It’s more difficult to track who your potential listeners are, if you are simply sending them to iTunes as opposed to your site. Pro tip: Don’t avoid social media platforms or podcast hosts like iTunes, or even YouTube, but don’t make it your goal to lead your traffic there. After all, you don’t own any of those sites. Your marketing efforts on them should be only the beginning of your conversion funnel. The goal is that the traffic to promote your podcast should, in the end, always land on your site. Your content should live on your website, and then get promoted on third party platforms that can get you more engagement. When you think about it, aren’t podcasting and blogging naturally a powerful marketing partnership? We’ve already talked about how important it is to have your own website that can benefit from all the traffic you’ll be creating with your social media marketing efforts. And blogging is a great way to boost any website’s traffic by helping you optimize it for search engines, and getting a better ranking on the SERP. You can guest-blog the same way you can be a guest on someone else’s podcast, and for the same reasons! If you are into affiliate marketing, you can insert links to the products, services, or websites you or your guests are promoting on your show. All forum communities have one thing in common: they absolutely hate shameless self-promotion. If you want to try your hand at spreading the word on Reddit, the last thing you want to do is go “you all seem to love oreos, so here’s my podcast episode about oreos”. That was a banal example, I know (if there’s really someone who podcasts about oreos, kudos to them), but you get the picture. Those who generally do well with generating traffic or downloads from Reddit do it by being an active member of the community and creating content that helps fill a need or directly answers a question. You might want to research how people are using the podcasts subreddit for ideas. It’s an online platform where anyone can ask and answer questions. The Quora community then votes which answer they found most helpful. You should also include a link to your podcast in your profile description. Want more listeners, an excellent reputation, and respect from search engines? Then, don’t ever forget SEO. Use synonyms, long tail keyword phrases, and keywords that appeal to your listener’s goals when they search. Some of these tips and tricks are fairly simple. Others will take quite a bit of effort. Some are free. Others will cost you significant amounts of money (okay there aren’t that much of those). But regardless of what your goals are, or what resources you have available, you can use some combination of these tactics to market and promote your podcast. So long as you’re committed to producing high-quality content, with your listeners’ best interests at heart, you have every chance of becoming successful. What’s your experience with promoting your podcasts? If you think we’ve left out any tips, don’t hesitate to share! And be sure to check out the other resources on social media marketing over at our blog. Kickstarting our series of the most definitive social media guides ever.